I’ve been using vinegar as an all-purpose cleaner for many years now because it’s safe, healthy and frugal, but the smell really bothers my husband. I think a lot of people shy away from using vinegar as a cleaner because they just can’t stand the smell. Well, today I’m excited to share an alternative that works great and smells way better. It’s 100% natural and easy to make. I used orange peels, but you could substitute any other citrus such as grapefruit, lemon, lime. etc. Citrus is in season right now so it’s the perfect time to stock up and recycle all those peels! 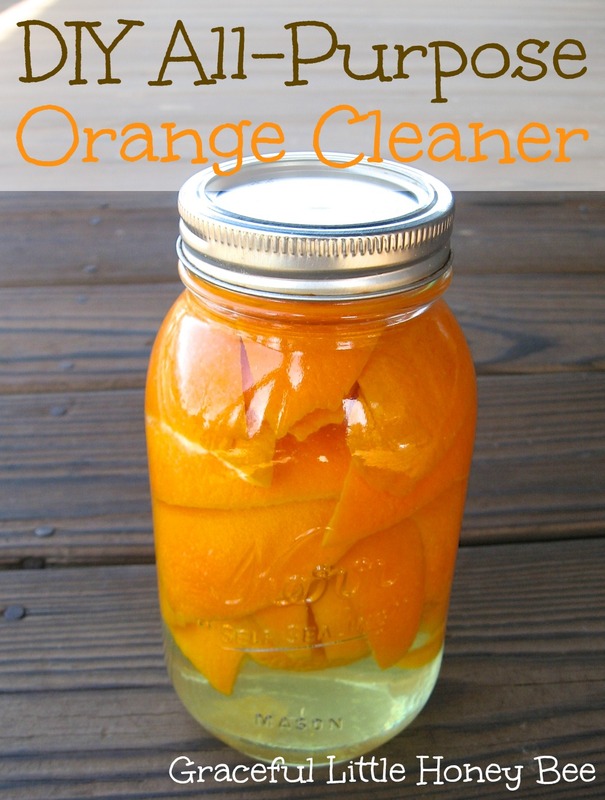 You may reuse the peels by covering them with vinegar again and repeating the process. Do you use natural cleaners in your home? If so, what do you use? I’d love to know! Great idea! I clean with vinegar quite a bit and usually add lemon or orange essential oil to help offset the smell. I'm definitely going to try this too! I am starting to use all natural household cleaners and really appreciate this tip for a DIY all-natural cleaner that smells nice too! So nice to know what's in the items that you use to keep your house clean! This is great. During orange season, I'll have to try this! Thank you for linking up to Frugal Friday. I've been wanting to switch over to some more natural cleaners for a while now, and love the smell of citrus. Can't wait to try this recipe! I should really do this. I love cleaning with vinegar but the smell just make me sneeze :) Thanks for linking up at Hit Me with Your Best Shot!